A tent pad eliminates the effort of finding a good spot on a campsite for pitching a tent. Tent campers can just put up the tent, choose which direction it will face and stake it down. For those readers new to tent camping, a tent pad is a designated and maintained area on some campsites for putting up a tent. This designated area is usually square and bordered by a single row of timbers which retain the fill. The timbers elevate the tent pad surface approximately 4" to 6" and allow it to be even and level, if built on rough or sloping ground. A tent pad looks something like a large sandbox on the campsite. 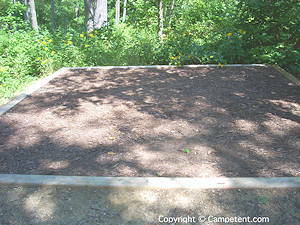 Some tent pads are not framed by timbers, but are instead slightly raised dirt mounds that are level and perhaps topped with wood chips. These are also easy to spot. Campers will most likely find tent pads at developed campgrounds, but may also find them at primitive campgrounds or even in wilderness campsites. A packed-dirt tent pad is economical and is the most comfortable of tent pads in fair weather. The packed dirt accepts and holds stakes well. The dirt fill may be covered by wood chips or pea gravel to reduce the amount of mud tracking in rain. Because dirt is not abrasive or sharp, a thin ground cloth is often adequate, as long as campers check for and remove any stones that could pierce the tent floor. The packed ground should minimize mud in light rain, but campers occasionally bring a mat to lay in front of the tent door. A covered doorway provides a place to store footwear out of the rain. Sandy soil is often encountered with tent pad fill. The mixture of dirt and sand holds stakes well and drains better than packed dirt. Sand can track, even in fair weather, so campers will need to take measures to keep the tent floor clean. Since sandy soil accepts water more readily than and doesn't pack as hard as packed dirt, stakes are more likely to loosen in this type of fill in moderate to heavy rains. Longer stakes can take care of this issue. Beach sand fill is not often encountered with tent pad fill. It is pretty much the domain of beach camping, which is a whole other animal from inland camping. Pure sand doesn't pack well and therefore does not hold stakes as well as other surfaces. Pea gravel is not often found in tent pads, but makes a quite comfortable surface for tent camping. The small, rounded stones drain well and eliminate mud around the tent during rain. Since the stones do not have any sharp edges, there is little risk of damage to the bottom of the tent floor. Standard tent stakes can be driven into pea gravel. Campers may be a bit dismayed to encounter a tent pad with just crushed rock fill. A gravel tent pad can be suitable for family tent camping, but takes a bit more preparation when pitching the tent. Gravel fill can even be welcome in heavy rain, because there will be no mud around the tent for tent campers to deal with. Campgrounds most likely choose crushed rock for tent pad fill, because it is inexpensive, indestructible, low maintenance and drains well. Sturdy stakes and a hammer will probably be necessary. Rebar and a small maul may also be useful if the rock is hard packed. Ask the campground staff what they recommend for staking a tent. Crushed rock presents a rough surface, as well as somewhat sharp edges to tent floors. Campers will need to take extra measures to protect their tent floors. A thick ground cloth under the tent will protect the tent floor from wear and puncture. A sturdy ground cloth can be a large, folded heavy-duty polyethylene tarp, a canvas tarp, a painting dropcloth, etc. This type of ground cloth will add bulk to your camping equipment, but will ensure a good camping experience on a gravel tent pad. A rug on the tent floor will make moving around the inner tent more comfortable. A self-inflating sleeping pad or an inflatable air mattress will provide suitable cushion for sleeping. Sand and gravel makes a suitable fill for a tent pad. The sand fills between the gravel and reduces the roughness of the surface. Small rounded colorful stones can also be found for tent pad fill. The provide a very comfortable camping surface and drain well. As with gravel tent pads, large, heavy duty stakes may be necessary to penetrate into the rock and to secure the tent well. Tent campers may notice that some tent pads with a fill that drains well will have a tile pipe that feeds out the downhill side of the pad to help water drain away from the tent pad in heavy rain. Campers should inquire about the surface of the tent pads at a campground, so that they bring the proper equipment to pitch and protect the tent. Tent pads vary greatly in size, depending on the region of the country and on whether the pad is designed for backpacking or leisure camping. A small tent pad will hold up to a 4 person family tent. A tent pad of this size is more likely to be found at a backpacking campsite, but can occasionally be found in a developed campground. A medium size tent pad will hold up to a 6 person family tent. Leisure tents used to be smaller than they are today, and a 10' by 10' tent pad was large enough to hold most family tents of an earlier era. Tent pads of this size are still common at old national park campgrounds and campgrounds on the west coast. A large tent pad will hold up to an 8 person family tent. Tent pads of this size are more common in campgrounds along the Appalachians in the east, but are found in other parts of the country. An x-large tent pad will hold many up to a 10 person family tent. These are often found at newer campgrounds and can accommodate most of the larger family tents of today. Tent pads of this size are common in campgrounds in the midwest, but are also found in other parts of the country. Each of these tent pad sizes provides roughly 50% more surface area than the next smaller size. Tent pads are also available in a variety of other sizes, square and rectangular. Tent pad sizes should also be applied to tents: A small family tent has walls up to 8' in length; a medium-size family tent has walls up to 10' in length; etc. If campgrounds and tent manufacturers would standardize on sizes, tent campers could then be sure that a certain size tent would fit on a certain size tent pad at a campground. Tent pads larger than 15' on a side are oversize. These pads can hold up to 12 to 14 person family tents, which is pretty much the limit in the size and sleeping capacity of a family tent. This size can be used to pitch 2 small to medium-size family tents, if necessary. Oversize tent pads are usually rectangular. An example might be a 12' x 20' pad. Campers are more likely to find these in group campsites, but an occasional individual campsite will have an oversize tent pad. Most campers with oversize tents expect to pitch them away from a tent pad on open ground. Campgrounds may be reluctant to provide oversize tent pads to accommodate oversize tents at individual campsites, because campers might be tempted to put up multiple tents on them or to otherwise over-occupy the campsite. X-large and oversize family tents are usually rectangular, so that at least one set of opposite walls is 12' apart or less. Square or rectangular tents with all 4 walls longer than 12 feet are usually either outfitter pole or outfitter frame tents, which need more pole structure than a family tent can provide. Outfitter tents are usually put up in the wilderness or at a group campsite on a large, open area of even ground. Other examples of oversize family tents are some 3-room family tents, which can be shaped as an "L", a "Y", or a rectangle. These tents are popular with families looking for a tent with separate spaces for various activities and family members. However, they might be difficult to site at a campsite that has uneven terrain and does not have an oversize tent pad. Campers are encouraged to inquire about the sizes of the tent pads at campgrounds in their area before shopping for a new family camping tent. The most important factor in sizing a tent to a tent pad is the length of the longest tent wall, not the area of the tent floor or the rated sleeping capacity of the tent. If the tent is too long for a tent pad, campers may need to pitch it elsewhere on the site, where the ground may be uneven and sloping. Many tent campers get carried away in stores by the picture of a huge tent on the box only to later find out that it is too large for the tent pads in their area. Huge family tents may also be quite unstable in more than light winds. Some campgrounds may require that the tent be completely staked and guyed out within the perimeter of the tent pad. This is not common and will appear in the campground regulations about putting up a tent. Many developed campgrounds have a limit of 6 campers on a site, and primitive campgrounds may have a limit of 8 campers on a site. A large tent pad does not mean that a campground will allow a large camping group on an individual campsite, unless the group is a single family. Tent pads are often found in non-electric campsite loops towards the back of the campground. Tent camping vehicles can maneuver more easily around a campground than large recreation vehicles can, and tent campers prefer to camp away from the main road, anyway. Ideally there will be trees to the south of the tent pad to shade the tent on warm summer days. The next best option is trees to the west of the tent pad to shade the tent during the hot afternoon. Tent pads are often located to one side of the campsite to allow a large open space for other activities on the site. 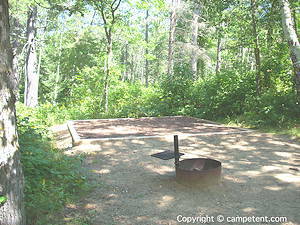 The tent pad should be located a good distance from and not downwind from a fire ring. Floating embers from a campfire can burn a hole in tent fabric. Campfire smoke can leave an oily residue on tent fabric. Since most fair weather and thus wind comes from the west, it is best if the fire ring is not located directly west, and thus upwind of the tent pad. The tent pad should be level with only a slight slope, and the surface should be in good condition. If a tent pad is not well maintained, the low end can slowly wash out, and the tent pad will develop a significant slope over time. There shouldn't be any signs of erosion or water channels on the tent pad surface. Inspect the tent pad before you select your camping site. If you feel that the tent pad on your campsite is not being properly maintained, contact the park office. Tent pads solve the two main problems of selecting a site for the tent: Level, even ground to lie on and raised ground to avoid flooding of the tent floor in the rain.